I've been eyeing this cardigan on Ravelry for a while now, and finally buckled down and got a copy of the pattern. I discovered that Jen from my knitting group has already knitted this before, so I'm über happy to know that if I have an issue with the pattern I have someone to talk to about this, rather than spending endless hours online trying to find an answer...hours that could be spent knitting! After Elvira, it's so nice to be able to work with a bulky yarn that knits up pretty fast. It's been only a few days and already I'm finished with the back and almost done with one side of the front! Fantastic! Quick results in a project is what I like to see! 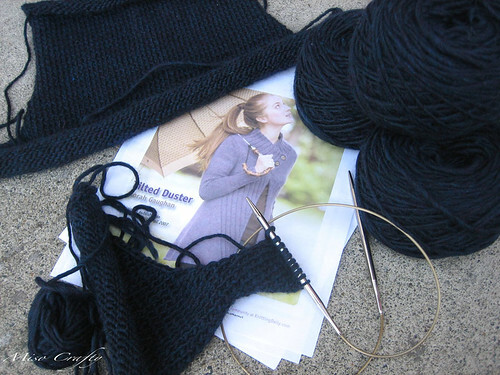 I had also downloaded the KAL podcast from Ready, Set, Knit to listen to while I knit this up and to get any tips/help. I didn't realize what a beginner knitter I still was until I started this project. I had a little trouble understanding how to divide my stitches to shape the back neck. I'm still not used to reading elaborate (to me, that is!) patterns, and not to mention that I was again over-analyzing the instructions. A quick trip to the Beehive to get a few skeins wound, to purchase the new Fall 2009 Knitscene magazine, and to ask someone there for help had set me back on the knitting road. Another hint that I'm still a beginner knitter that has no idea what she's doing: I went to my knit night on Tuesday and found out from Mary (the woman is all-knowing! Thanks Mary! :) Maybe this'll solve all my future knitting woes?) that I wasn't purling right. It turns out that I was twisting my purl stitches! No wonder why my knitting never looked like everyone else's! And no wonder when I was trying to find instructions on how to twist a purl stitch, that I was having problems with it...I've been twisting those bad boys already! Grrr... 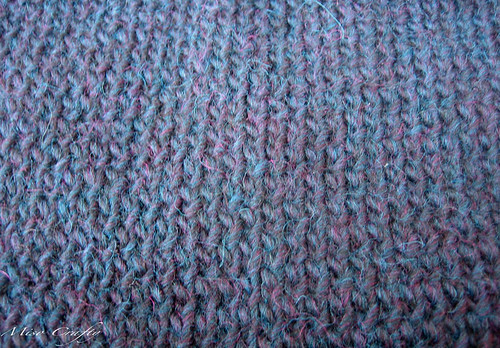 I'm going to continue to twist my purl stitches for the rest of this project, just so that it looks uniform. But now I can't wait to start a new project so that I can see if I can make "normal" purl stitches! Man, I am such a beginner! 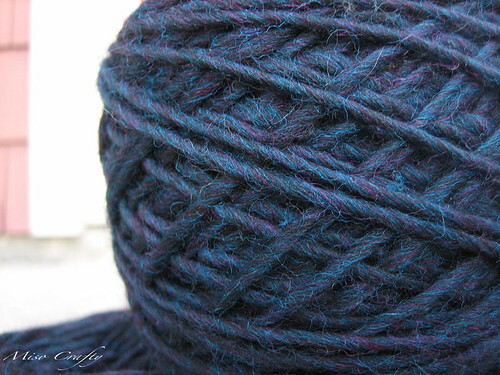 Anyways, here's a close up of the yarn I'm using, which is Berroco Peruvia in Blue Nile. A little story about this yarn: when I was picking up yarn for this project, I was going into the store thinking that I was going to get black. But then I saw this yarn. In the shop it looked back with hints of blue. When I took it outside to get a better look at it, the color appeared to be a dark navy blue with hints of both turquoise and magenta. When I got it home the yarn took on another different color. This time it was more of a denim blue, but still with turquoise and magenta thrown into the mix. I had checked out the Berroco website and it was SO blue in their photo. As in a powder-y blue. So weird. I still love the color, I just think it's odd how it looks in different lighting. The duster should be interesting once it's knitted up. I'm really hoping that this project doesn't take me a month to finish, like Elvira did. But after reading that I'm going to have to pick up over 200 some odd stitches for the skirt...well...I'm keeping my fingers crossed that I don't run into mistakes galore! I'd like to pretend I'm all knowing, but I think it's just because I learning new things all the time and had read about that purl thing. :) I'm glad I can help. That's what the knitting group is for! THANK YOU, THANK YOU, THANK YOU Mary!! I'm soooo freakin' excited! I think you are all-knowing. Solely on the fact that you called it pretty much the second you saw my knitted piece!